A classic Kiwi bach with sensational views from both house and garden. Completely private, beautiful, mature subtropical garden extending right to the sea, with bush reserve on one side. A path winds through the garden to the sea and the garden is for your exclusive use and is not shared by another dwelling. Enjoy the company of the Tuis then watch the sun set into the sea. The section and house face directly north for maximum sun and are completely protected from westerly winds by a flank of Mount Karioi. There is a flat lawn area for outdoor living. 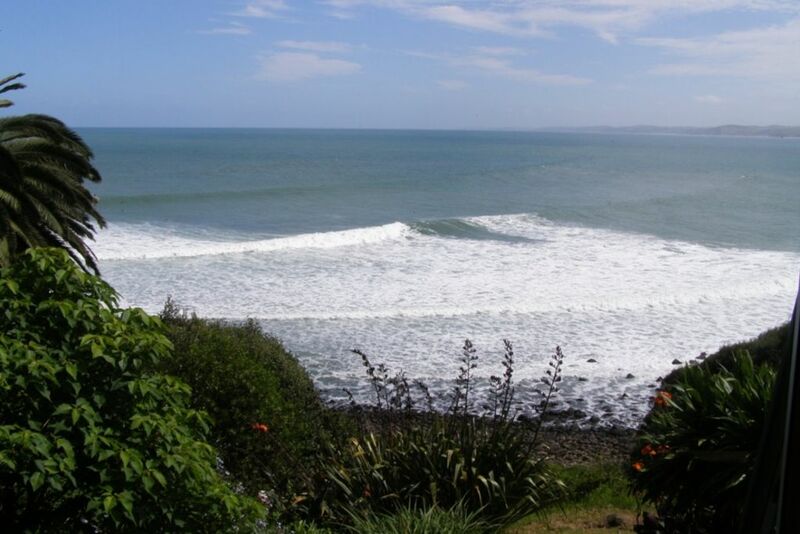 Get out of the world famous Whale Bay surf and it’s only a minute’s walk to the bach and a hot shower. The sound of the sea at night is helpful for people with sleeping problems. The bach is small, open plan, and has one king and one single bed upstairs. There is a very small bedroom downstairs with a camp stretcher. Bring your own sleeping bag and pillow for this. Bed linen provided, but you can bring your own if you wish. No cellphone coverage from bach, but you can get it 100 metres down the road. A flat area of lawn where you can place the lounger chairs provided. Absolutely love this Bach has everything you need just the basics, nature and beach we didn't want to leave.... beautiful gardens tranquil setting secluded and private amazing views soooo relaxing!! no phone no service no tv exactly what we needed away from the rat race.. thank you for sharing your little peace of paradise Martin loved it!! A hidden gem 10 mins away from Raglan town. The property has been looked after by loving hands and it was evident visually both indoors and outdoors. Thank you Martin for letting us use your beautiful space. We stayed here for 12 days. The bach is basic and it has everything you need for a comfortable stay. It was a great experience to stay in an 1960s bach. It brought back memories of growing up in a different time. There is no phone reception, internet or TV and it was great to detox from technology. The view of the surf and the bay from the bach and garden is exceptional. It was a great place to chill and watch the view, listen to the roaring ocean and the chorus of birds in the garden. It is not far from the main surf breaks in Whale Bay. Martin is a great host and made us feel welcomed and answered any queries we had. Highly recommended. Lovely little back to basics batch. We loved our stay! Super private. Will be back.